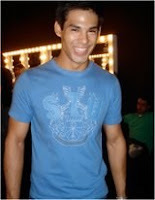 Yes, in my dreams - whenever stress knocks out the gay in me, I simply turn to this pic: The smiling Leandro Okabe. Geeky smile eh? Yet his body (like in the pictures to follow below this post) can make a gay man's uterus go elliptical. You know what I mean when I say that. He makes my pain go away, he makes me go to sleep. He makes me, simply gay - and happy. Sweet dreams everyone. Let's kiss some more for a bit, after all, the potato is being steamed now. Just don't make me drop it.